Katarina Edwards, Chef de Cuisine at Yellow Door Bistro, understands and appreciates how much work goes into farming and ranching as her family had working farms in the BC Interior. Born in St. John, New Brunswick, Kat grew up on BC Farms around 100 Mile House, Quesnel and later in Vanderhoof where her family raised free-range goats, wild boar, rabbits, cows and poultry. Her family also made much of their food from scratch sourcing as many ingredients from their farm to make breads, butters, cheeses and other items. Kat’s love for the harvest from the land led her to pursue culinary studies at Okanagan College in Kelowna where she learned from top instructors like Chef Geoffrey Cooper. She completed her apprenticeships and secured her Red Seal Certification working for Chef Rod Butters (who has also worked with great Hotel Arts alumni like Duncan Ly over the years). While developing her craft in the Okanagan, she was impressed with the tight knit group of chefs and how they contributed to their community with numerous collaborations and charitable endeavours. Kat also marveled at the strong relationships between chefs and the farming community due, in part, to the abundance of products grown/raised in the region. It wasn’t uncommon for 6-7 local farmers to drop off products daily at the restaurants she worked at. Chef Edwards is keen to build on her BC experiences and develop a strong rapport with both the local farming and chef communities. Yellow Door Bistro already has great relationships with local and regional farmers and producers and the culinary team has been active in the food community with diverse events like Cook it Raw Alberta, Harvest Moon, Brewery & the Beast, Gold Medal Plates and Visa Infinite Dinners, among others over the years. 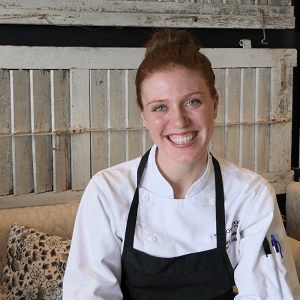 As Chef de Cuisine at Yellow Door Bistro, Kat develops menus for a full-service restaurant offering breakfast, lunch, dinner and a popular weekend brunch. Kat is continually introducing new and seasonal items with her daily three and five course dinner creations that feature hand-selected wine pairings. She is excited to showcase creative dishes showcasing regional ingredients served up in a whimsical yet approachable style.